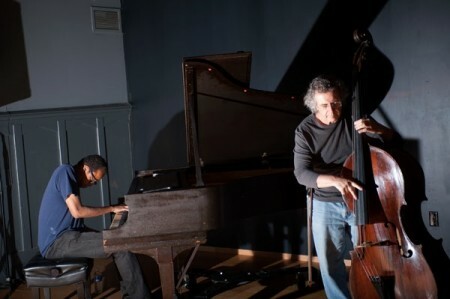 Matthew Shipp has played piano since he was 5 years old. He studied at the New England Conservatory of Music with saxophonist Joe Maneri and cut his teeth working with saxophonists Roscoe Mitchell and David S. Ware and bassist William Parker. Shipp holds two enduring label relationships with Hatology and Thirsty Ear, where he also serves as curator and director of the label’s Blue Series. Bassist Michael Bisio, no stranger to Seattle audiences, invariably astounds with the beauty of his tone and the intensity of his very personal musical language. As a recording artist, Bisio appears on nearly 100 CDs and has had vital working relationships with Joe McPhee, Charles Gayle, Barbara Donald, Bill Smith, and Stuart Dempster, among many others. As a composer, he has been recognized with nine project grants from various arts organizations; in 2003, he was awarded a Washington State Artist Trust Fellowship.